Responses aside, the list above is a relatively comprehensive summary of what you can do with a social listening tool. And frankly, I’d argue you should be doing all of these things—not just the top three or five. 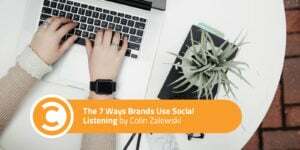 Let’s walk through this list and discuss the importance of each and how you can use social listening to execute these tactics more effectively. Social is one of the few multi-purpose communication channels for brands (along with email, chat, etc.). It’s a marketing channel, but it’s also a customer service channel. Customer service representatives often have their own set of tools for managing questions on social, but that doesn’t mean social marketers are exempt from listening to their customers’ commentary on social. They may have the luxury of relying on the customer service and PR teams to handle complaints and crises, but they’re not off the hook on this one. A social following cannot thrive without a strong community as its foundation, and community is not built by shoving content down people’s throats—it’s built by engaging in conversations. Like any conversation with someone you don’t know well (yet), there are some topics you’ll want to avoid. By using a listening tool to stay aware of the types of concerns and complaints coming through social, you’ll keep from putting your foot in your mouth when you reach out to engage in positive conversation with people who could become brand advocates. This one is too easy. Good marketers are both knowledgeable and wary of their competition. As you position yourself for success in the competitive landscape, you’re going to need to know your competitors’ strengths and weaknesses. They will tell you all about their strengths on their website; that side is easy. The weaknesses side is a bit more challenging. Social listening tools make it possible to tap into the rumor mill about your competitors, so you can discover what people don’t like about their brand, products, etc. After you’ve learned their shortcomings from the most credible sources out there—their customers on social—determine how you can double-down on your competitive advantages. If your brand operates in the fidget spinner market, and you discover your competitor is catching a lot of flack on social for their products breaking, you can reposition your message around the quality and durability of your spinners (assuming that’s a strength of your product). Now you’re better positioned to gobble up market share from the competition. Be careful—this goes both ways. More on that later. A word cloud can be a good starting point to determine which of your competitors are being talked about most, especially if you are in a saturated market, and what attributes people associate with your competitors. Product Category Listening: This is where you listen to a conversation about a defined product segment. For example, let’s pretend you work at Under Armour. 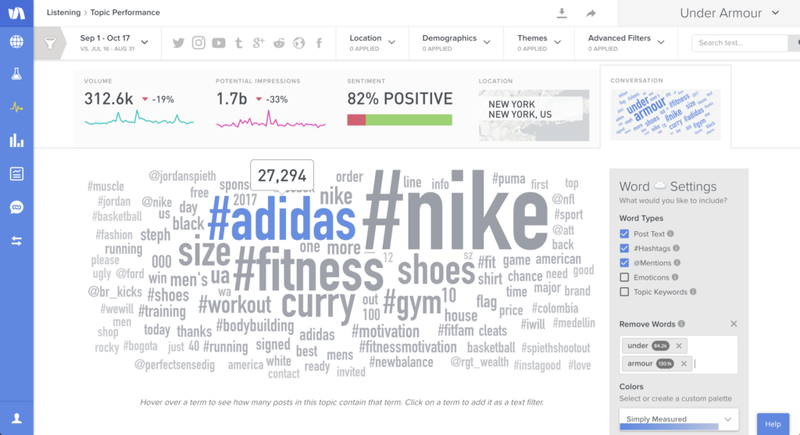 Beyond just your brand, you’d also want to listen to what people say about basketball shoes, and then zoom in to analyze what they say about your basketball shoes versus competing products in the same category from Nike, Adidas, etc. Product Theming: This is where you listen to a conversation around your brand (or a competitor’s brand) and create sub-segments within the conversation about specific products and product lines. For example, you may listen to the conversation about Under Armour, then create thematic segments for posts about shoes, hoodies, shorts, etc. There are merits to both options. Option one will capture discussion of your products even when your brand name isn’t mentioned. Option two will constrict conversation to your products when your brand name is also mentioned, but you can get a consolidated overview for your brand’s various product lines. Creating thematic segments by product or product characteristics help you determine the scope of conversation and affinity for various products and product lines. Organizations are always looking for ways to extend their own message, and one way to do that on social is to hitch your wagon to a trending hashtag. A good social listening tool will not only tell you what happened but also help you understand what’s emerging. Finding emerging hashtags that (1) align with your brand voice and message and (2) are already being used by people talking about you is an effective way to stay relevant and shareable. Influencer analysis is something everyone is talking about but only some are doing. Identifying and listening to influencers have become playing stakes for any respectable listening tool. There are some tools that exclusively do influencer identification; frankly, I recommend just going with a listening tool that has influencer identification functionality. You’ll get more bang-for-your-buck, and you need to be able to see the activity of the influencer within the context of the rest of the conversation to determine if they are in line with the tone of the audience you want to access. How do you determine what makes a good influencer? Consider what outcome(s) you want from a potential influencer partnership. Are you seeking more reach? Consider someone who has a large following and whose content is shared a lot. Do you want more engagement? Go with someone who gets a lot of engagement on the content they are already posting related to your brand. Do you want to improve brand sentiment? Find someone who is already an advocate for your brand and posts frequently about your brand. 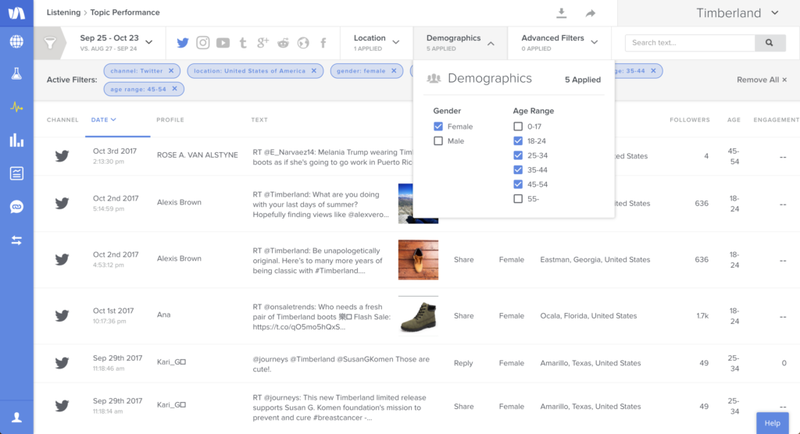 Analyzing specific demographic groups by gender, age, and location tells you what types of messages and media will resonate most with a given audience segment. Come on; this one’s too easy. 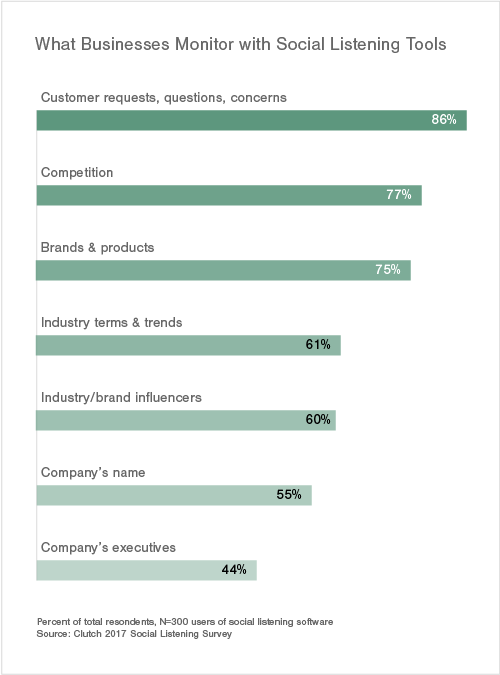 Yes, you should listen to what people say about your brand. Frankly, I’m surprised only 55 percent of people surveyed said they were using a listening tool to hear what people say about their own brand. Not listening to what people say about your brand is like going on vacation and leaving your door wide-open. You’re just asking to get ransacked. But, even if we entertain the idea of an imaginary world where nobody ever says anything bad about your brand or products on social (see the “Competitive” section above), you’re still in trouble because your content will be tone-deaf. Social starts with community, and community starts with conversation. Use a listening tool to understand the demographics of the people talking about your brand, what gets them excited (positive sentiment), and what subjects are a little touchy (negative sentiment), so you when you publish your own content, it’s relevant and well-received. People buy from brands they like and boycott brands who make insensitive remarks. Keep your foot out of your mouth. Listen to what people say about your brands and products. In many ways, social has leveled the playing field for credibility and influence. Maybe Elon Musk isn’t a member of your executive team, but your executives, even at a small company, can be powerful thought leaders and build brand trust. Some brands and many agencies are already leveraging their executives’ social presences as part of their marketing mix, but for those who aren’t already, a listening tool can help you get started. You’ll want to listen to what competitors’ executives are saying on social, as well as how some of the major executive influencers conduct themselves on social. Your executive team will likely need a little coaching, so study what messages are resonating, what posting frequency is appropriate, and how other executives stay on message while being authentic. Then, after using your listening tool to research these elements, use it to measure the engagement and shareability of your executives’ content, so they can see the difference they are making. Speaking of measurement, listening tools can do a lot for you, but they can’t do everything. Social is a part of the entire buyer’s journey, which means you’ll also need to measure how people engage with your brand’s social content, how they get to your website from social, and ultimately, the role social played in their decision to become a customer. 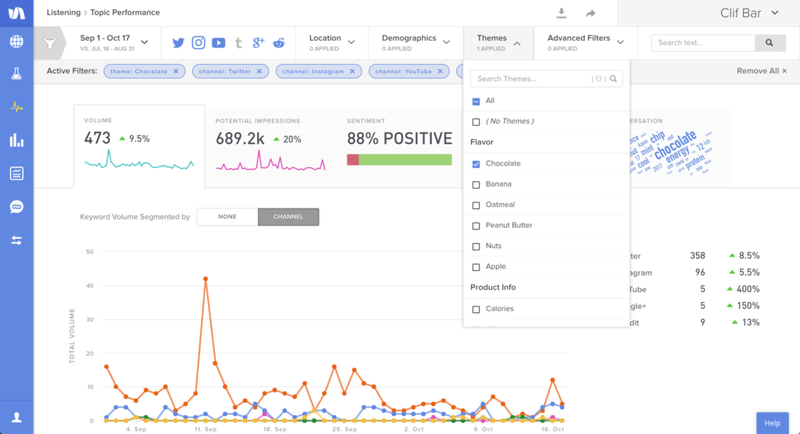 If you’re interested in a demo of Simply Measured Listening and the rest of our full-funnel social analytics solution, so you can measure social’s role in the entire buyer’s journey, click here. Colin Zalewski is a Product Marketing Manager at Simply Measured with a passion for full-funnel digital marketing. He enjoys a round of golf, a Kentucky Mule, and warm evening walks with his wife and dog.